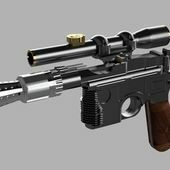 The model attempts to capture many of the details of Han Solo's DL-44 from Star Wars: A New Hope. The reference images I used came from blurry screengrabs and Lucasfilm archive photos online. The model is printed in many parts to maximize detail and ease of painting. Some parts require support and glue to assemble. The heatsink is problematic to print. I printed it sideways such that the ridges are laying on the printbed. I printed with PLA support material, but soluble support material will definitely help it print better. -Sight cap screw (print 2 of this to fix the sight to the slide). -A modified slide with a hole to insert the bolt stop. -A new grip with a rounded bottom, more similar to the original grips. Print 1 and another flipped for the other side. All good except for the trigger. There was no mechanism it just set in place and flopped around. Also the orientation to print the cooling vents was a bit tricky. Trigger and trigger mechanism fail. Assembly instructions are missing, especially inside the trigger. This is great! Anyway you can share the actual step files? 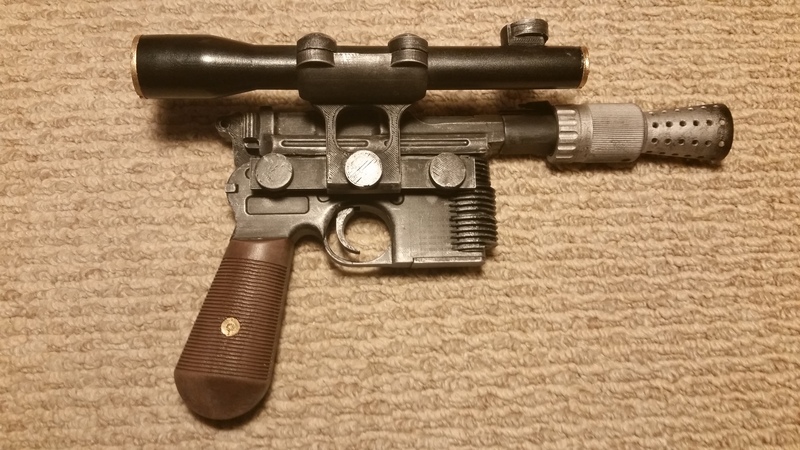 There are a few details I'd like to adjust to make it even screen accurate. Thanks! Thanks for such an awesome model. 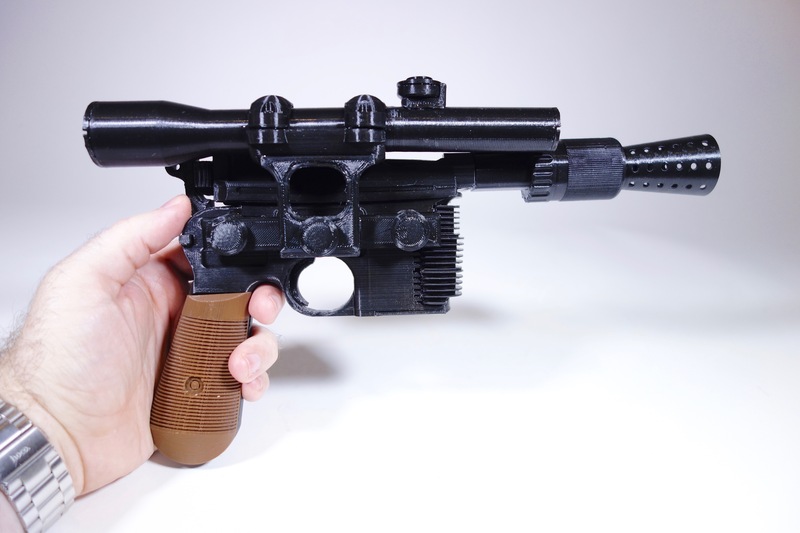 I have yet to buy a 3D printer, but this will be one of the first things I print when I get it sorted. I want to build a display cabinet filled with iconic blasters and pistols from my favourite sci-fi films. This will take pride of place. 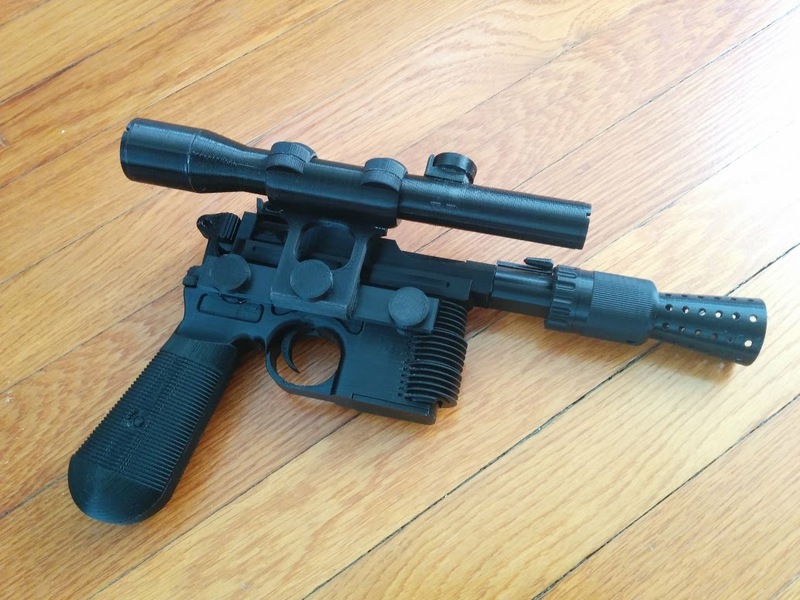 This is maybe one of the best Han Solo Blaster I found on the web, but it has minor changes to make it the best. I just started to modify the parts to share it with the creator. I really like this model! The printing and assembly mostly went well, but some more explanation about what orientation to print the parts in would’ve been helpful. I had to redo a few of them because I ended up using supports when they weren’t necessary (the flash hider) or because I used the wrong orientation (for the heat sink on the front, it seems best to print it with the ridges facing upward). I noticed that the front part of the scope on the assembled model that was posted was put on backwards (with the dial toward the edge instead of toward the middle). I mimicked this during assembly, but was able to reverse it before the glue dried. I did end up putting the dial on backwards though. Which orientation did you print the heatsink? I did it vertical with supports and am having a lot of trouble removing all the supports. Great work!, but this is missing the piece that is supposed to be located behind the trigger.